The sixth, and final round of the all conquering DPE Victorian Country Series, has been run and won in two largely overcast days at Portland’s Yarraman Park Circuit. 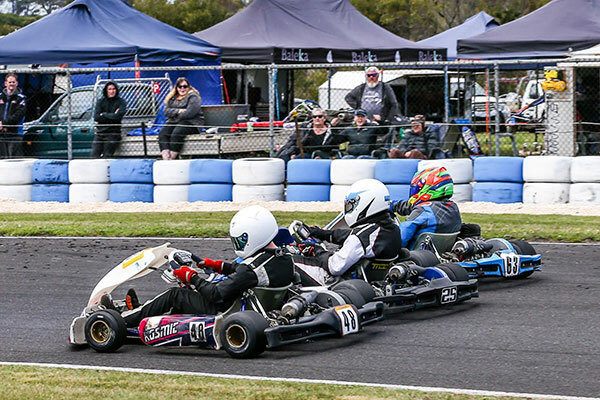 The final round attracted 179 karters from Victoria and South Australia to the immaculately presented 760 metre venue. The final round was afforded a different format to the proceeding five rounds, with qualifying, three heats and a final allowing competitors to bolster their standing in the series points. A weekend of awesome racing followed as the drivers utilised the multi lane Portland circuit to create a thrilling climax to the VCS season. 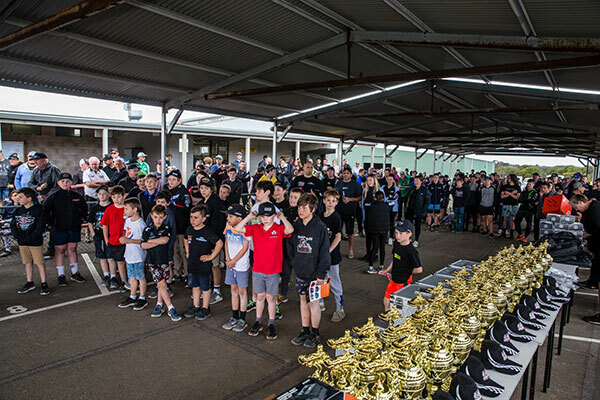 348 different karters and 1293 entries have raced in the 2018 DPE VCS season, and the Portland season finale was a great end to a very enjoyable series. Series organisers were delighted to give away the lion’s share of the $74K 2018 prize pool at the end of racing on Sunday. One of the big winners was Charlee Richardson, winning a brand new Corsa Racing kart thanks to DPE Kart Superstores, just a day after suffering a very bent kart in an on track incident. The weather was largely clear all weekend, but a well timed shower just 15 minutes prior to qualifying had competitors in the first few classes racing to their pit shelter to decide between wets or slicks. Fresh from a Race of the Stars campaign the weekend before, It was Jobe Stewart #30 who struck the first blow of the weekend, taking pole on a damp track. His time of 40.203 was 7 tenths faster than his nearest rival. Bronson Boult #71 and Kobi Williams #94 rounded out the top 3, both setting very close times. Kobi Williams would take the championship ahead of Ryan Morgan and Hugo Simpson. The opening session for the youngest racers of the weekend saw the South Australian Champion Jensen Marold #31 put himself in pole position, setting the fastest time (42.719). As expected his usual sparring partner Rusty Ponting #21wasn’t far away, settling for third after being pipped by James Anagnostiadis #9. Rusty Ponting had an unassailable lead in the championship after round 5, but was kept very honest with some of the best racing of the series in the final round as the young cadets gain more and more experience. Neon Leon Forrest #11 fired the first warning shot of the weekend, by taking pole position (38.003) by 2 tenths over the speedy John Page #18. Page, Ian Branson #66, Matt Crane #97, Phil Smith #4 and Andrew Stubbs #55 were covered by a tenth in positions 2 through to 6, proving the competition was going to be hot. Ron Taylor #92 was a casualty of the session, losing a wheel after completing just one lap. Ian Branson would go into the weekend with a tidy lead over Phil Smith and Matthew Crane. He would hold onto that lead by just 74 points, while Leon Forrest would vault into 3rd after a stellar final round. The series point score was very close heading into the final round of this class, and true to form it was Brett Jenkin #6, Cam Austen #55 and Andrew Harvey #51 right up the pointy end. Harvey put his best foot forward taking pole position (38.907) from Jenkin and Harvey. Incredibly the top the three all did 38.9 second qualifying laps on lap 5! Mount Gambier driver Trevor Pevitt #98 was the best of the rest. Harvey was staring down the barrel of a clean sweep as he rolled out for the final, whilst Austen and Jenkin understood the job at hand. Harvey again made a great start and looked set to continue his blistering form. However Austen had other ideas, as he hit the front for the first time for the weekend on lap 9. It wasn’t long before Jenkin also pounced on Harvey dropping him to third. Austen timed his run to perfection to take the win from Jenkin and Harvey. Rogers took a solid fourth place. It would be Andrew Harvey’s earlier heat wins that would seal him a championship win, but just 72 points from Cameron Austen and Brett Jenkin. 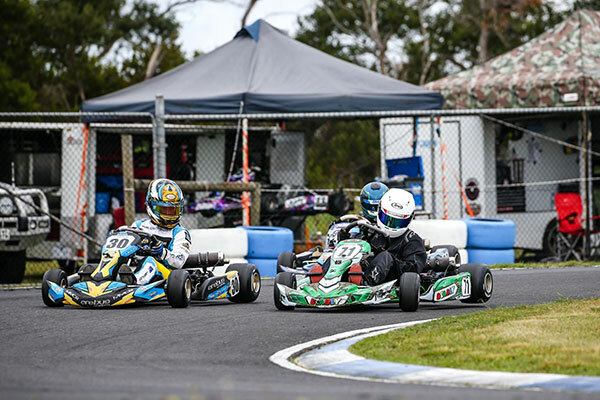 His championship deciding weekend got even better when he was one of 2 lucky winners of a 2019 VCS series pass, and also won the DPE Senior Kart Star of the Day. A good sized field of 15 karts rolled out for the Restricted Medium class, and it was the black plate holder, Billy Westerveld #2 who would rise to the top with a time of 38.083. Westerveld’s time was only a tenth clear of his title rival Beau Humphrey #28, with Michael Mifsud #84 edging out Alex Baker #19 for the final spot in the top 3. Billy Westerveld would enter the final round 196 points ahead of Beau Humphrey, but having done 1 less round. With the best 5 rounds counting and the final round having an extra heat, calculators were melting throughout the weekend trying to work out who was in the lead. Westerveld ended up taking the championship by 141 points from Humphrey. KA4 Junior Light is always one of the most hotly contested classes and the youngsters didn’t disappoint. Nicholas Sacco #80 was the swiftest in qualifying, taking pole with a 37.357. Closely shadowing him were his foes for the weekend, Bronson Boult #71, Jobe Stewart #30, Matthew Domaschenz #92 and Christian Cowie #15, all covered by three tenths. It would be Domaschenz’s first VCS race in juniors after a very successful 5 rounds in Cadet 12. Nicholas Sacco’s wins sealed the deal for the series as well, winning the championship from Jobe Stewart and Christian Cowie. KA3 Senior Light enjoyed a strong field of 19 karts, with plenty of depth throughout the field. Nathan Williams #95 was rapid, taking the pole with a time of 36.599 ahead of Corey Herbertson #25. Jack Bell #37 was in third, the margin between he and tenth being only 3 tenths in a tight session. Going into the final round it was Corey Herbertson ahead of Jaxson Cox and Jack Martin for the series. Both needed a great weekend to unseat Corey, but he would prevail for the championship despite a drama filled final relegating him down the order, and Jack Bell would jump into 2nd overall. Whilst not having the same big field as KA3 Light, KA3 Medium always proves entertaining as the field chases the benchmark that is Remo Luciani #20. Luciani drew a line in the sand in qualifying, topping the session with a 37.388. Just 4 hundredths off Luciani was the ever competitive Chris Thomas #7, threatening to take down the champ. Third belonged to emerging local Todd Chambers #42, with Heath Jelbart #14 and Aaron Jackson #13 rounding out the top 5. The story of the third heat came on the first corner as concertina contact from the inside bumped Luciani into a spin and eventual DNF. This was a very unusual sight for most in the field, being Remo’s first DNF at a Victorian Country Series event in many years. Remo already had the championship sown up before the final event, but Chris Thomas kept him honest all season, finishing 2nd 463 points behind the master, while the racing margins at each event were minuscule. On paper the Cadet 12 field looked to be very open following the departure of Matthew Domaschenz, and qualifying was a clear example of it. Putting together a stunning lap was SA’s Annalise Ellis #42, who set the pace to take pole with a time of 40.348. The top 16 karts were within a second of Ellis’ time, but closest was local Brocklan Parker #7 and Xavier Avramides #55. Darcy Heyne #60 and Thomas Schmidt #36 rounding out the top 5. Matthew Domaschenz had confidently won the Cadet 12 championship before moving up to KA4 Junior Light at Portland. The final 2 podium spots were to be disputed between Thomas Schmidt and Brocklan Parker. Schmidt’s good weekend sealed second position in the championship, while Parker maintained 3rd. The hotly contested KA4 Junior Heavy field was littered with class and hard chargers and promised to be a fascinating duel. Winston Smith #28 made the most of qualifying to head the 20 kart field with a time of 38.553. 2 tenths away was Joel Johnson #5, who lead a conga line of karts on very similar pace. Third belonged to Riley Jabke #44, with Johnny Hill #88 and Zaiden Barry #63 in fourth and fifth. Daniel Hookway ended up having a bit of fun in a different chassis at the final event after putting his championship beyond doubt at round 5. Joel Johnson claimed 2nd position, with Zaiden Barry holding off Johny Hill for 3rd in the series. Always big numbers, always chaotic, Tag Restricted Light didn’t disappoint in Portland. Local gun Todd Chambers #42 started the weekend with all guns blazing, scorching to pole with a 37.295. The veteran Steven Malkin #12 parked it on the front row, just ahead of the improving Dave Menzel #99. Andrew Rae #96 and Aaron Neilson #86 signalling their front running aspirations in fourth and fifth. Joseph Clough survived a DNF in the final to claim the championship by just 91 points from Brock Rae. Andrew Rae would take 3rd in the series; one of 3 Raes to take home series trophies. TAG Light saw the arrival of a new force, 14 year old SA driver Blake Purdie #48 signalling his arrival with a stunning pole position (35.355). Purdie pipped Connor Farr #82 for the position, with Domenic Romeo #12, Jordan Rae #9 and Mav Benson #2all doing 35.5’s to round the top 5. The opening heat saw Purdie given a rough and tumble initiation to the class as he dropped well down the order before recovering to sixth. Farr seized the opportunity, and drove to a well deserved win. Rae was never far from the lead, finishing second ahead of Nathan Williams #95 who had recovered to 3rd. Heading into the final round Jordan Rae had a small margin from Connor Farr and Domenic Romeo in the series. Low numbers in Tag Heavy as it tapered off late in the season. The King Brothers, Scott and Adam were the class of the field, going 1-2 in every session. Scott took pole position with a time of 35.946. The order of the opening two heats was Scott, Adam, Aaron Jackson and Paul Feely. Jackson would retire in heat 3, elevating Feely behind Scott and Adam. TAG Heavy almost didn’t form at Portland, with most drivers ready to jump into another class given pre-entries. But a championship was on the line and Aaron Jackson needed just 64 points to beat Scott King to the title. It was always going to be a tough ask to beat the King brothers at their home track, and Scott King would take the championship ahread of Aaron Jackson. We hope you have enjoyed what we believe to be one of the best karting series in Australia.We sincereley thank all clubs, officials, sponsors, volunteers, commentators, photographers, first aid, competitors and everyone else involved in making this our biggest year in memory.